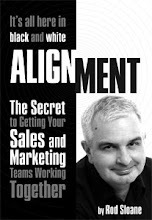 Sales and Marketing Alignment Blog from Rod Sloane: What have you sold today? I sold my beloved VW Passat today in less than four hours from start to finish. I got seven times more than my wife expected. What have you sold today and if you have when are you going to get paid for it?